Shhh don't tell TOF, it's a birthday surprise! He is going to be soooo excited. 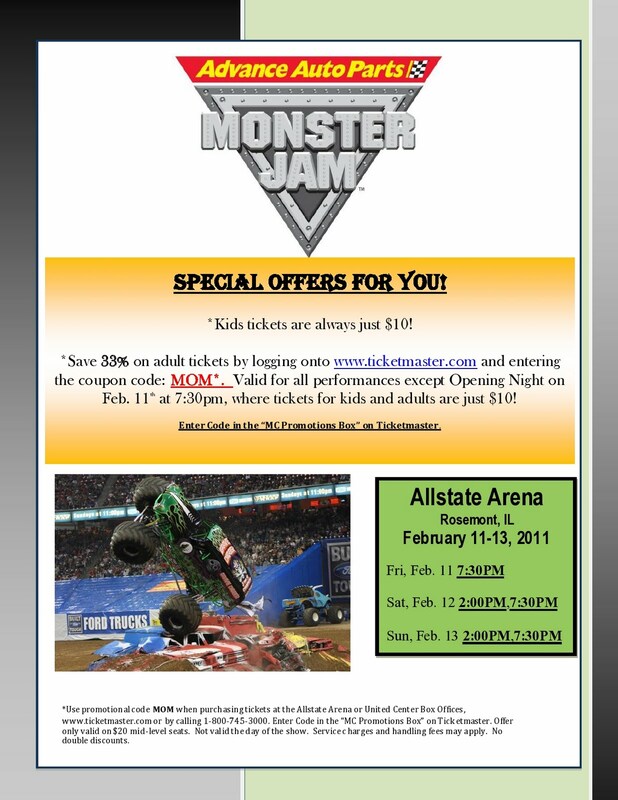 Monster Truck Jam is coming to Chicago at the Allstate Arena from Friday February 11 through Sunday February 13 and we're going. But I also have a very special offer for you! Log onto to www.ticketmaster.com and use the promo code MOM in the MC Promotions Box to save 33% on adult tickets Saturday and Sunday. All tickets for Friday night are only $10 and children's tickets are $10 for all shows. Enter Code on Ticketmaster. Offer only valid on $20 mid-level seats. Not valid the day of the show. Service charges and handling fees may apply. No double discounts. Disclaimer: My family was given tickets to attend Monster Jam. I received no monetary compensation and will purchase ear plugs on my very own.